In this issue we have the conclusion of the story of Prestwick Airport, an extended “Cards are out There”, Leonardo Pinzauti on an Egyptian airline, some other Egyptian items and some follow up to What Do You Know. Roger May provided details of the BAA issue cards of Heathrow T5. We can now look forward to a new set featuring the baggage mountain, illegal fingerprint scanners, passengers jammed in a variety of conveyances and the likely six figure pay off cheque for those responsible. 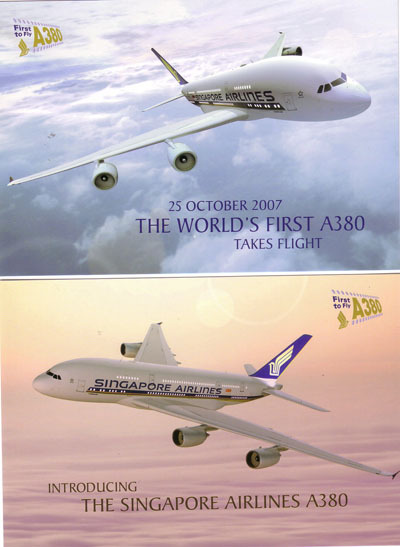 On a more positive note, the entry of the A380 into service has caused Singapore Airlines to resume issuing cards with aircraft on, and the two examples are shown on the front page.